Now that my hip has healed enough that I am doing dancer's pose and getting through BodyPump and Power Yoga classes with zest, I can see more clearly what I want to be doing with my life. I want to write, draw, create and share my discoveries and ideas with you and with curious people. I also want to motivate and share the knowledge that our bodies can heal and recover and accomplish movements and sensations that are life changing, or at least, strengthening. but also opening between my bones and stretching muscles that have been twisting into knots overnight or at the office. It feels graceful, elegant, as if I'm connecting with my inner ballerina. A man came up to me at the gym yesterday where I was going through some barre moves to use in class and asked if I was a gymnast or a ballerina. I told him no and he marvelled at how "strong" I was. This is true! He was holding a cane and had been struggling with knee problems for 10 years. He said the trainer at the gym had him doing squats. When he showed me, his technique was jarring, awkward and he looked pained. It felt wonderful to be able to tell him I'd had a hip replacement and squats were a major part of my rehabilitation but they have to be adapted for our bodies at the stage they're in. So we went through technique. It was a small part of my day - maybe 10 minutes - but it felt fabulous for hours. I sometimes take for granted having a strong sense of body awareness and how to align and stretch and move in the safest, most effective way to train and strengthen. It matters in moments when I can heal myself or guide others to use their bodies in the most meaningful way. My Yoga Teacher Training starts in Februrary and I can't wait. 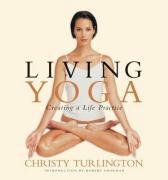 I read Christy Turlington's "Living Yoga" about 6 years ago and it was life altering for me. I started the book because of the pretty pictures, but was incredibly inspired and moved by Christy's story of discovering holistic health (becoming an anti-smoking advocate), setting up a charity for mothers, and studying religion and spirituality at university. She fully immersed herself in the history and philosophy of yoga and there is so much to learn and to experience on and off the mat. I hadn't realised until that point. I'm most looking forward to becoming a yoga student for life. To accepting and embracing that I will never master it and know everything and be guru-like, but that my passion and love for yoga will motivate the yogis who do my class to investigate ideas and movements that are new and interesting to them. Or just to get into a pose they hadn't believed was possible! Talking of being able to do that, I know that a 9 - 5 office job is not possible for me at this point, if ever. I love moving. I love instructing. I love the energy of being in a class and both instructing and learning so much about bodies, movement, rhythm and how to motivate and coach. Every class has its own rhythm and energy. I am thrilled to now have more classes at Ivanhoe Aquatic & Fitness Centre, very close to where I grew up. I am also hoping to add to my schedule of barre classes this year while also (hopefully!) getting some writing and content editing work so that I can have the ideal mix of writing, editing, sculpting, toning and instructing. If you're interested in doing yoga or barre classes, or you're already doing them and you have a place you'd recommend, come and tell me about it on Facebook!